Delhi Public School, Mathura Road felicitated the Class XII students of the 2017-18 batch in an annual award ceremony held on 17 November 2018 in its premises. The Chief Guest for the occasion wasDr.PawanindraLal, Director Professor, Head of Surgery – MaulanaAzad Medical College and a 1985 batch alumnus of the school. The Principal ShriManoharLalcongratulated the parents of the awardees for supporting their wards in bringing their vision to fruition in the form of results par excellence. 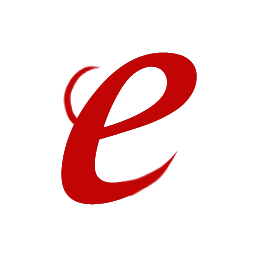 The awards were given out in two rounds to a total of sixty students in various categories, including Subject Proficiency andOverall Proficiency. Twenty-seven students were honoured for being scholars in continuation for nine years while twenty-nine were awarded the Principal’s Commendation Award for Highest Marks in each Subject.Thirty-seven students were felicitated for scoring A1 in all five subjects. Stream-wise toppers were also felicitated with gold medals and trophies. The award for the highest marks in Geography was dedicated to Mrs.ShubhraMalhotra who served the school and mentored students for over three decades before her suddendemise in 2017. In his address, the Chief Guest, Dr.PawanindraLal stressed about the importance of academics, sports and hobby and in that order. Reminiscing his students days at DPS, Mathura Road, he urged the students to understand rather than learn a concept by rote. He praised the Odissi performance by RiyaGulati, a student of Class X and lauded the efforts of the school in honing the intellectual as well as creative abilities of the students. He also congratulated the parents of the awardees and reflected with great delight on the perseverance shown by the students who had been scholars for nine continuous years, encouraging them to forge ahead with the same zeal and enthusiasm. 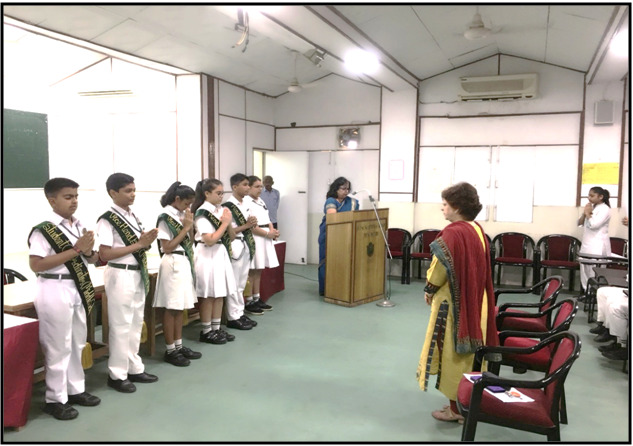 Ms.DeekshaKhera, Vice Principal (Academics) presented the vote of thanks and the event concluded with a rendition of the National Anthem. The Annual Award Ceremony for Class X-XI, batch of 2017-18, was held at DPS, Mathura Road on 28 September 2018to award the students for their outstanding achievements in academics and co-curricular activities.Mr. Abhilash Mathur, Chief Metropolitan Magistrate, TizHazari Court graced the occasion as Chief Guest. The Principal, Shri Manohar Lal welcomed the Chief Guest, awardees and their parents and members of the PTA, following the ceremonious lighting of the lamp. He advised the students to always persevere and to strike a balance in all aspects of life. He also informed the audience about SDD (Screen Dependency Disorder) and urged parents, especially, to ensure that their wards steered clear of it. A patriotic musical rendition by the school choir enthused one and all present. The ceremony saw felicitation of Scholars, Gold and Silver Medalists, Gown Holders, Subject and Overall Proficiency Awardees and All Rounders for the Class X and XI batch of 2017-18. A total of 101 students from Class X and 46 students from Class XI received awards for their performance in academics, while 26 and 30 students, respectively form Class X and XI were awarded for their achievements in co-curricular activities. Samar Islam Laskar and DhruviAggarwal from Class X and Naman Gupta from Class XI bagged the All Rounder Trophy for the session 2017-18. AbhikBasu and Vibhuiti Roach of Class X and XI, respectively, received the All Rounder commendation trophy for the session 2017-18. The Chief Guest, Mr. Abhilash Mathurcongratulated the meritorious students and advised them to always make informed decisions in their lives after recognising their competencies and letting go of all inhibitions. He urged them to take care of their bodies as a body is a person’s first home.The members of the dance club left the audience spell-bund with their Bengali Folk Dance performance. The vote of thanks was rendered by Ms. DeekshaKhera, Vice Principal (Academics). National Anthem brought the much-awaitedceremony to a close. The Annual Academic Award Ceremony for ClassesVIII and IX for the academic session 2017-2018was held on 24 September, 2018. The constant efforts and hard work of the extraordinarily brilliant students was recognized and they were awarded for outstanding performance in academics as well as co-curricular activities.The Principal,ShriManoharLal, Vice Principal Academics, Ms. DeekshaKhera,Vice Principal Administration,Ms Reema Sharma, Headmistress Junior School, Ms. Anju Sharma,Career Mistress, Ms. MadhumitaSaha, along with the PTA representatives presided over the event. The Chief Guest for the occasion was Colonel Rajmeet Singh, a highly decorated officer who has been awarded the Yudh Sewa Medal and the Guest of Honour was Mr. Sanjay Kumar, currently posted as Regional Commissioner at EPFO Headquarters. The event commenced with the ceremonial lighting of the lamp followed by a soulfulprayer by Senior School students. The Principal, Shri Manohar Lal addressed the gathering and congratulated the proud parents of the awardees with his inspiring words. In his address, he acknowledged the role ofteachers in grooming the students to face the challenges of life. He also thanked the parents for playing a vital role in nurturing their children and helping them to realise their dreams. The Chief Guest, ColonelRajmeet Singh, congratulated the awardees and his message for the students was to ‘Stand Tall and Walk Tall’, he also advised the students to do well in academics and at the same time pursue their hobbies. The Guest of Honour, Mr. Sanjay Kumar, advised the students to strive ‘Faster,Higherand Stronger’. He also reiterated the need to work hard and choose from a wide variety of fields available to students today. In the Academic Session 2017-2018, 96 students of ClassVIII were awarded Scholar Badges, 15students received the Co-curricular award for excellence in Art, Music, Dance and other activities. In Class IX, 86 students were awarded Scholar Badges and 16 students received the Co-curricular award for excellence in Art, Music, Dance and other activities, one student was awarded a grey blazer. A scintillatingOdissidance performance by Ananyashree of Class X enthralled the audience and a melodious song presented by Swarlipi Sarkar and Pranay was appreciated by all present.Vice Principal,Administration, Ms. Reema Sharma rendered the vote of thanks. She said that “Excellence is not an art, but a habit.” She acknowledged the efforts put in by the Principal, Vice-PrincipalAcademics, teachers, and the organising committeein making the event a grand success. The national anthem bought closure to the much awaited morning. The Annual Academic Awards Ceremony for ClassVII was organized at DPS, Mathura Road on 21May, 2018. The constant efforts and hard work of the extraordinarily brilliant students was recognized and awarded for their outstanding performance in the academic session 2017-2018. The Principal, Shri Manohar Lal, Vice Principal,Academics, Ms. Deeksha Khera,Vice Principal,Administration,Ms.Asha Tuli, Academic Coordinator Ms Reema Sharma, Career Mistress, Ms. Madhumita Saha, Headmistress Junior School, Ms. Anju Sharma along with the PTA representatives presided over the event.The event commenced with the ceremonial lighting of the lamp followed by a Saraswati Vandana by Senior School students and a soulful Santoor recital which mesmerised the audience. The Principal, Shri Manohar Lal addressed the august gathering and welcomed the Chief Guest, Ms. Sharmistha Mukherjee with a bouquet and a shawl. The Principal congratulated the proud parents of the awardees with his inspiring words and addressed the students of today as leaders of tomorrow who have to equip themselves with challenges that lie ahead in their lives. In his address, he thanked the parents for playing an important role in nurturing the children and helping them to excel in life. His message for students was that ‘Success doesn’t come by chance; it needs determination, sweat and hardwork to outshine’. The Chief Guest for the occasion wasMs. Sharmistha Mukherjee, who is a political activist , an accomplished kathak dancer and the President of Delhi Pradesh Congress Committee. She congratulatedthe students for having the privilege of studying in such a prestigious institution and advised them to make the best use of the facilities in order toacquire knowledge and enhance their skills. This academic year saw 75 students of ClassVII being awarded Scholar Badges and13 students received the Co- curricular award for excellence in Art, Music, Dance and other activities in the academic session2017-2018. Dance is a great way to connect emotionally with the audience. A scintillating Kathakdance performance left the audience spellbound. Vice Principal,Administration, Ms. Asha Tuli rendered the vote of thanks and acknowledged the hard work put in by the teachers, parents and the organisers in making the event successful. The Annual Award Ceremony for Class VI was held on 28 July 2018. The ceremony commenced with the lighting of the lamp by the school Principal Shri. ManoharLal, Vice Principal Academics Ms.DeekshaKhera and Vice Principal Administration Ms.AshaTuli, Headmistress Junior School Ms.Anju Sharma, Academic Coordinator Ms.Reema Sharma and the members of PTA. The Chief Guest for this event was Dr D.K. Pandey, a well-known educationist. After the invocation to the almighty by the school choir, the school Principal – ShriManoharLal, in his welcome address, appreciated the achievements of the talented young students who made the school and their parents proud. He emphasized that awards are not only for academics but also to motivate the children towards other activities. Total number of students receiving various awards was eighty-nine which included the awards for overall proficiency, scholar badge, gown holder, subject proficiency holders and all-rounder. Twelve students received the co-curricular award. AbhishekMandal of class VI-A secured the first position with an aggregate percentage of 98.07%. The Bharatnatyam dance performance touched the souls of the audience. The Chief Guest, Dr D.K Pandey thanked the gathering and the Principal, calling DPS Mathura Road the pilgrimage for school education in India. He also highlighted the importance of education and concluded by congratulating the parents and the award recipients. The Vote of Thanks was rendered by Ms AshaTuli. The ceremony concluded with a rendition of the national anthem. An assembly was conducted at D.P.S Mathura Road, for classes VI-VIII on the 06th of September 2018 .It was well organised and conducted by the students. 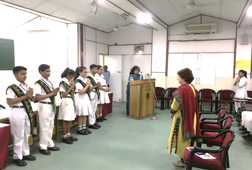 A pledge, rendered by the Vice Principal was taken to install the Swachh Abhiyan mission in the young minds. The students very enthusiastically and whole heartedly participated in the assembly. On the occasion of Teachers’ day, a special assembly was organised at DPS Mathura Road on 5 September 2017, to reach out to all the teachers who have inspired hope, ignited imagination and instilled a love of learning in their beloved students. The assembly commenced with the lighting of the lamp by the esteemed Principal, Shri Manohar Lal, Vice Principals, Ms. Deeksha Khera and Ms. Asha Tuli, and Head Boy and Head Girl batch 2017-18. A soulful presentation of shloka was followed by a Bharatnatyam dance. The Principal extended a warm welcome to all the teachers and paid tribute to the legendary Gurus who played an important role in shaping India. In his address he mentioned late Dr. APJ Abdul Kalam by quoting one of his popular saying, “If a country is to be corruption free and become a nation of beautiful minds, I strongly feel there are three key societal members who can make a difference. They are the father, the mother and the teacher.” He also read out the message from the Chairman, The Delhi Public School Society, and Shri V.K.Shunglu. The role model teachers were felicitated with a cheque of Rs. 25000/- and a shawl for their exceptional knowledge, educational expertise, communication skills, dedication and patience. The valued employees were also honoured for their hard work and years of devotion to the school. Shakespeare once said, “If music be the food of love, play on play on.” The Western Music Club of our school enthralled the teachers with a foot tapping musical performance. A beat boxing act by Raghav Monga left the audience mesmerized and the very talented Indian Music Club presented a medley of classical songs. The students of Class XII concluded with an exhilarating dance performance as a tribute to their teachers. The vote of thanks was rendered by the Vice Principals of the school, Ms. Deeksha Khera and Ms. Asha Tuli. The assembly ended with the gathering rising up for the National Anthem. Cleanliness drives for Swachh Bharat- Swachhta Pakhwada September 2017). Our school has taken numerous initiatives in the month of September 2017 for the Swachh Bharat Campaign within the school wherein the students, teachers, the Principal and other faculty members took steps at an individual level for a cleaner, greener and more prosperous school environment. The school assembly for senior school was conducted with the Slogan ‘Earth has music for those who hear’. The assembly was based on theme Conserving Mother Earth. The coir added to the rhythm with a beautiful song sending the message of preserving our planet for next generation. The dance group performed a musical show based on five elements of earth to be preserved in nascent form. DPS Mathura Road organised the Republic Day Special Assembly on 25 January 2018 for Classes VI-VIII. The Principal, Shri Manohar Lal, addressed the gathering and explained the historical significance of Republic Day. He also mentioned the role played by great leaders like Pt.JawaharLal Nehru and freedom fighters like Bhagat Singh who laid down their lives to break free from the bonds of slavery. A melodious patriotic song ‘Jai Jai Bharat, Jai Jai Hindustan’ was presented by the school choir, evoking feelings of pride and nationalism among students. A soulful musical performance by the school orchestra mesmerised the audience. The Principal,Shri.Manohar Lal along with the Vice Principals Ms.Deeksha Khera Ms.Asha Tuli and Ms.Renu Rajvardhan, Coordinator Middle School acknowledged the hard work put in by our students and gave away awards for various literary, cultural and sports events. Anirudh Jain of Class VIII was awarded a trophy and cash prize of Rs.2,50,000 for bagging the first position in the 16th International Open Grandmaster Chess Tournament. A skit was presented by the students highlighting the sacrifices made by soldiers who lay down their lives fighting for their country. An exquisite dance showcasing national pride and patriotic fervour was performed by the students of classes VI and VII which enthralled the audience. The national anthem brought closure to the much awaited morning. A special assembly was organised on the occasion of Children’s Day at DPS Mathura Road on 15 November 2016. The assembly commenced with a prayer followed by a melodious song by the senior school teachers. 14 November is celebrated every year in memory of Pandit Jawaharlal Nehru, who was the first Prime Minister of independent India. He was a nationalist statesman and a prominent lawyer, especially popular among children as Chacha Nehru. Speaking on the occasion, the school Principal Shri Manohar Lal wished the students and blessed them for a better future. He also commented upon the innocence and importance of children and informed how the school has bought a telescope as a Children’s Day gift. Following this was an enlivening dance performance by Junior School students and teachers. Succeeding was a gripping skit by the senior school teachers and solo song performances by the staff. The teachers of the Music Club won a thunderous applause for a mellifluous instrumental performance. The students of the school Drama Club too won the hearts of the audience by an appealing ‘Nukkad Natak’ on Child Rights and informing the students about the dramatics event, ‘Tamasha’. The assembly was much enjoyed.